This was the rest of my Sunday cooking spree that produced the butternut squash soup in my previous post. A busy day! 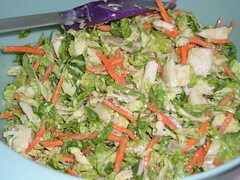 I made the Brussels Sprouts slaw here with shredded sprouts from Trader Joes (so convenient! ), throwing in some carrot I needed to use up. I used just a smidge of a mustardy mayonnaise and some white balsamic vinegar, plus lemon zest and juice. I got the overall idea from a New York Times recipe for Lemony Brussels Sprouts Slaw. 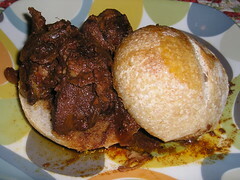 During the day, I’d been hunks of pork shoulder in my crockpot with a jar of Saveur’s Dragon Flames Honey Roasted Ancho Chili Glaze. I had that in my pantry, a find at Marshall’s a while back, and it needed to be used. It was delicious! Spicy and just a hint of sweetness. Sadly, when I googled the product, it does not seem to be available any more. Oh well, a fleeting pleasure, and I’ll keep my eyes open for the next interesting find. My down-home bbq dinner was just delicious. And using the crockpot made it so easy that I made that soup and the slaw, too. And finished and turned in whatever article I was working on that weekend. Whew!